This wedding cake with pink flowers looks so elegant, yet is pretty simple to do yourself. If you've never decorated a wedding cake with fresh flowers, be sure to check out this step by step tutorial. 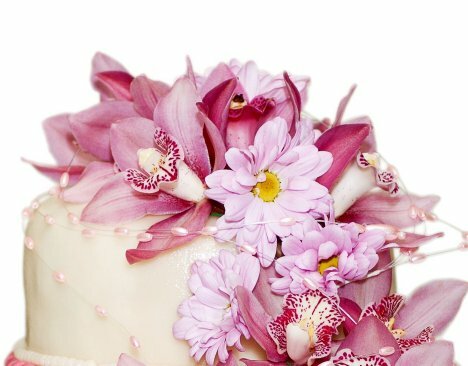 It deals with the details of keeping real flowers from contaminating the cake in any way and how to prepare the flowers for inserting into the cake. 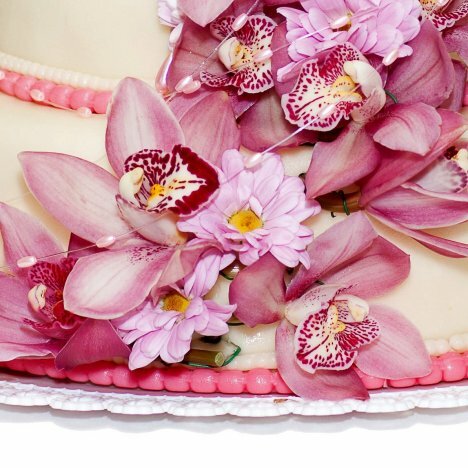 This lovely garland of pink cymbidium orchids wind down from the top of the cake to swirl around the side of the cake and ending in a flourish at the bottom layer. Using this photo as a guide, take care to angle the face of the flowers in the directions shown. Prepare the flowers, giving them a tepid soak in cool water. Lay each out on a towel to dry. Mist each flower head with Finishing Touch and allow to dry. Cut ovals of parchment paper, slightly smaller than the diameter of each flower. 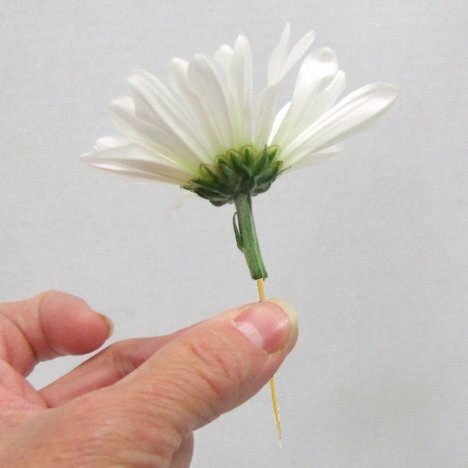 This paper is meant to be pierced in the center with a toothpick, then slid onto the toothpick on the back of each flower, providing a protective barrier between the cake and the back of the flowers. Cut the cymbidium stems to about 1" of the back of the flower. Insert double ended toothpicks firmly into the shortened stem of the orchid, then wrap down with white stem tape, leaving the portion that will be inserted into the icing bare. To keep the design on track, I gently insert a toothpick lightly into in each place on the wedding cake - one marker for each large cymbidium. These markers will keep you on track on where to insert each cymbidium as you move down the side of the wedding cake. 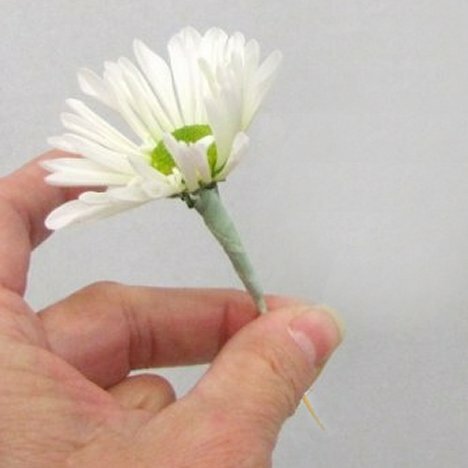 Cut each daisy stem short and insert a double ended toothpick into the stem. Using a clean roll of stem wrap, start at the bottom of the flower and tape down about halfway on the toothpick, leaving the rest bare for inserting into the cake, in between the cymbidiums. 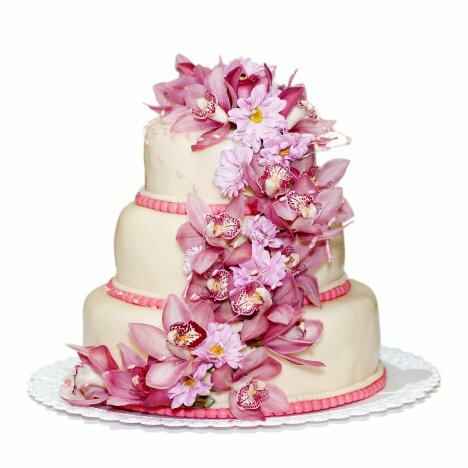 Although the colors of this wedding cake with pink flowers is very striking, please don't feel that you are limited to only to pink orchids on the cake. Cymbidiums come in an assorted colors as well as the daisies. Be sure to plan out the time for decorating the cake. Some wedding bakers will insert the flowers for you, others will only deliver the cake and insist you have someone add the flowers after the placement in the reception hall.